There are many times when you simply don't want to make a full batch of biscuits. This delicious and quick recipe makes just a few tasty, fresh from the oven biscuits in less than 30 minutes. This recipe is almost as easy as those canned biscuits you can buy at the store, yet they taste much better. Mix the flour, baking powder, and salt in a medium-size bowl. Work in the butter and shortening with a fork. Slowly mix in the milk until a soft dough is formed. Pat the dough down until it is about 1/2 inch thick. Cut the dough into four to five equal-sized biscuits and place them on the greased pan. Even if you are just dabbling in baking, you will find that this recipe is a breeze. It's the perfect biscuit recipe for beginners. Because it makes just a handful of biscuits, it's a great way to practice and fine-tune your baking skills. 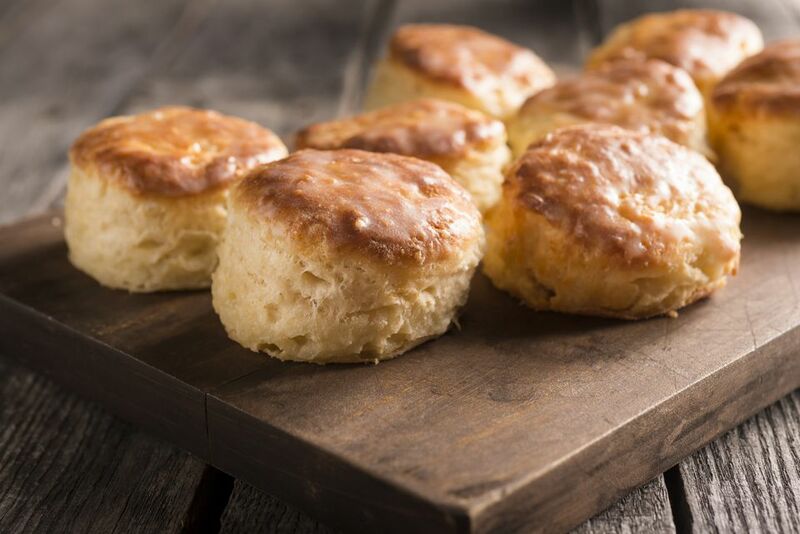 Biscuits are a bit different than other baked goods and there are a few tips and tricks that will help you get the most out of this simple recipe. Be sure to preheat your oven before starting. These biscuits mix up in just a few minutes and your oven should be to temp by the time you get them on the baking sheet. Wait until the oven gets up to the correct temperature. To ensure proper and even baking, don't put your biscuits in the oven until it reaches 400 F, no matter how rushed you are. Those extra few minutes will make a world of difference. Biscuits should not be mixed until the dough is perfectly smooth. A few lumps are actually a good thing in this type of dough, so don't stress about getting it perfect. Mix the biscuit by hand with a large wooden or plastic spoon. The dough is too stiff for most electric mixers and it's likely that you'll burn out the motor. If you are out of baking powder, you can make a baking powder substitute by combining 1 teaspoon baking soda and 2 teaspoons cream of tartar. This will make 3 teaspoons, so measure out the 2 1/2 teaspoons needed for the recipe. Is your milk a little sour? It's okay to use it if it's just a little bit past the expiration date. You might have a different opinion, but bakers have survived sour milk (aka 'bread milk') in their bread and biscuits for years. Some even make sour milk on purpose because it adds a bit to the flavor. If your biscuit dough is sticking while patting it down, don't worry. Either lightly dust the top with a bit of flour or use parchment or wax paper on top of the dough while pressing it. When your biscuits come out of the oven and are still piping hot, brush them with butter. It's optional, but will soften the crust.